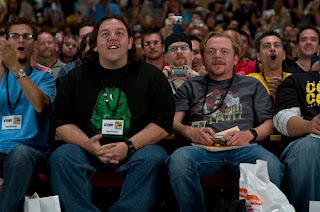 I'm not the biggest Nick Frost & Simon Pegg fan in the world. And although their works do have a certain charm about them. I’ve only really enjoyed moments of their films after many, many viewings in a similar way to the process Alex undergoes in A Clockwork Orange. However I quite liked the bold audacity of Shaun of The Dead. Don't hold it against me I'm not from the UK originally and there are subtle cultural nuances that you have to take account – like a lot of Frost & Pegg’s work is underpinned with the notion that their lives as fanboys in the UK are somewhat underwhelming in the shadow of bigger & better - and they make do. A lot of people in the UK can relate to this. So could I - which is why I left my hometown and came to London. But those are just me sensibilities. Please don't read in to this that I don't think that Nick Frost or Simon Pegg aren't talented as I really do admire them for everything they achieve. A win for them is a win for fanboys all over. So Paul starts off pretty much how I expected, based on the bits I had seen and heard so far. But I am struck at how good the cinematography looks in the establishingshots. The throwback to earlier nostalgic times i.e. the 80s starts with technique rather than scripted references. The film doesn’t feel digital it feels like widescreen celluloid. Comicon Fanboys <–> Alien chasers. I would like to assure you norms or non Fanboy readers that these 2 types of people are very rarely manifested into a single person type as presented in Paul. In fact in my experience these are 2 completely different fields of specialism. Alien chasers looking down on the Fanboys and their super hero worlds, and the Fanboys have nothing more than a passing interest in the weird world of Alien chasers. And if a road trip similar to the one in Paul was planned - other destinations would surely be given greater importance. See Fanboys The Movie as a reference. Suddenly it felt like Frost & Pegg’s Paul characters seemed less of a natural extension of their Spaced universe and more of a tacked on intro to cash in on the growing army of fandom. Where did this sit in the larger landscape? Well I’m guessing the successful Simon Pegg and Nick Frost have shrugged of their humble beginnings and in an effort to increase their influence in the US have shifted from "WE love this stuff and are fanboys" to "we know YOU love this stuff and are tapping into it". The flip side to this is that I think their films will have a much wider appeal than just their original core fan base. 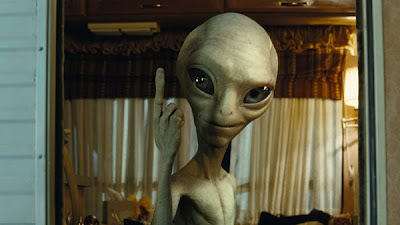 Ok so once I get over that and drop back into the story we are introduced to, Paul I have to say he/it is by far the most believable looking alien I have ever seen (on screen). There is only one brief scene in the entire film that I saw a bit of dubious green screening. It’s worth noting that after years of working in and around graphics my jaded eyes can spot these things at a 100 paces – so this is high praise even if I am saying so myself. I found Seth Rogen's Paul incredibly believable and a little cheesy. He looks and sounds (not his voice but his wisecracking world view) a lot like Roger the wise-cracking alien from American Dad. But after a while I was completely into him and his cheesy humour was rubbing off on me - pretty soon I'm actually loving the alien. The bulk of the film is our leads getting to know Paul and their road trip across the US. Along the way we meet all strange manner of characters (and lots of familiar faces) split between either chasing or joining them on their odyssey. Although much of the humour was a little too blatant or obvious in referencing popular fan culture for me (much like the bulk of Frost & Pegg’s earlier works) - believe me, you will definitely recognise most of the stuff thrown at you, which ties nicely into Frost & Pegg cashing in on low lying fruit, I mean currying favour with their new Hollywood pals I mean the fact that Paul has been acting as a Government advisor and influencing culture behind the scenes. There were some great moments that spoke directly to me (unfortunately too few and far between) like the bar brawl reference to Spielberg’s 1941 as well as the road trip and depth and breadth of characters is a nod to John Landis’ The Blues Brothers. Seriously at least one reference to “a full tank of gas, half a pack of cigarettes, it's dark, and we're wearing sunglasses” wouldn’t have gone a miss amiss if thrown into the mix. 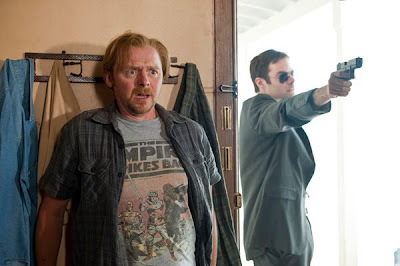 Like Shaun of The Dead was a homage to George Romero's Zombie films and Hot Fuzz a parody of cop buddy films Paul is Frost & Pegg’s love letter to the 80s films of Steven Spielberg, Robert Zemeckis and John Landis. After the half way mark it really hits it’s stride and feels like I was watching some film magic, like say Back to the future but for the first time. It really has the exact same feel of playful discovery. The down side to this is that it suffers slightly from a lack of originality. It does seem as if Paul is trying to address two audiences: the parents/older crowd who'll get the in-jokes and references and the younger crowd who will be watching a reboot off E.T. possibly for the first time. The longer play on this is that a whole new younger audience will be introduced not only the delights of Frost & Pegg but some of the best moments of recent cinema history. I'm not the biggest fan of spoofing or parody, it was funny when I discovered and when done with a subtle hint it can be a device to engage the audience but I think half the humour of Paul is so blatant it is aimed at a younger audience than myself. The other half is brought by the American contingent in the cast and very much in the realm of Greg Mottola (Adventureland, Superbad, Arrested Development) and in the general area of Saturday Night Live and its hit or miss character spin offs. I don't make mention of the acting as it's all fairly good and I really enjoyed the breadth of characters. It was a bit disappointing to see Jason Bateman in a big but just OK role I've been a fan ever since "It's Your Move" and always hope that he is discovered as this incredible A-List talent that he is. So in short Paul moved me from thinking that it seemed to be a whole lot of disparate, fan boy bait bits combined with a transparent attempt by Frost & Pegg to further their influence in the US film industry -> through to sharing in their journey and Paul growing on me as a character not just a CG prop -> to finally actually really enjoying it's post future take on things. I do think I was in minority with my early negativity as any one who was in the audience of this advance screening could hear everyone was absolutely loving it. Even some of the usually most cynical film peeps who I caught up with after the screening - loved it. But I think it is safe to say that Nick Frost and Simon Pegg are all grown up now and we may have to share them with big world out. Good luck guys. It's "amiss" not a miss you jackwagon.